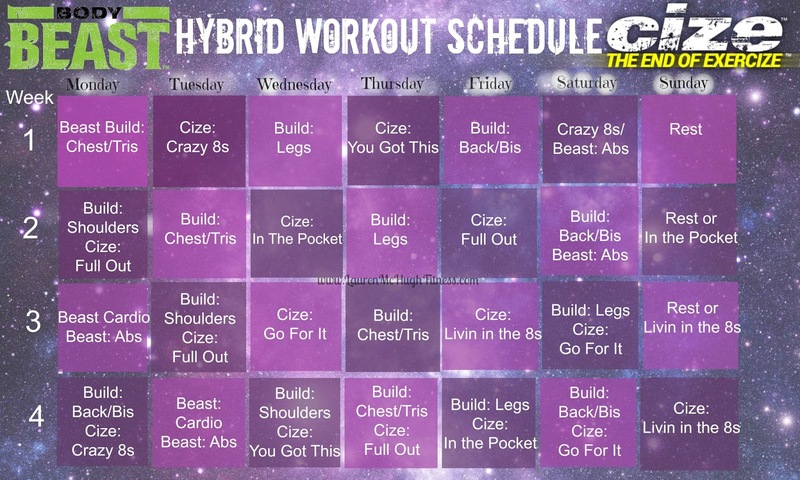 I'm so excited to announce my new hybrid workout schedule for the next 60 days!! I've been waiting for the program CIZE (by Shaun T, creator of Insanity and Max 30), to come out for months now! It's finally here and I've been thinking I need to make a major change. I've owned the program Body Beast for a while now, and this program is entirely weight lifting. I got my best results when I was doing Insanity Max: 30 and Les Mills Pump, which is a ton of intense cardio and lifting. However, I want to push myself out of my comfort zone even further. What better way to do that than incorporating two of the most opposite programs out there?! CIZE is all about learning how to dance--literally anyone can do it. I was a tap/jazz dancer growing up, but when it comes to the dance floor (unless it's line dancing), I have NO rhythm. Like, it's sad. While CIZE is the End of Exercize, Body Beast is the complete opposite. You are lifting weights the entire time. Sagi is the creator, a two-time "Mr. Israel," and beast of a bodybuilder--pun intended. There is some equipment needed for this program, but there is one dude on screen doing the workout with limited equipment, which is what I'll be following. Instead of a bench, I'm using a stability ball. Instead of an EZ curl bar, I'm using dumbbells. I do have a pull-up bar I'll be using as well. I'll be going up in weights since you really want to challenge yourself in this. I absolutely love lifting weights and saw great results with the 21 Day Fix Extreme, so I know I'll see incredible progress with this program. 2. I've been talking to several people who completed Body Beast and got extremely toned--like bikini comp ready! 3. I love cardio, and I didn't want to just focus on one program--I get bored easily and thought I could have my Shaun T fix, lol! If this sounds like something you'd be interested in doing with me, please fill out the form below and we will start crushing our goals and getting in amazing shape together! Workout is the most essential way to stay healthy with a health diet. Thank you for sharing it with us. You can have any day as the first day of your new lifestyle. You need to plan your success, to make it really happen. i am excited about this, are you? Ohh...this is good to be a part of this website so we can participate. Work Citation - Paul, B., n.d. SeroVital HGH Review: Dr. Recommended Formula. [WWW Document]. HGHOfficial.com, i.e. HGH Official. URL, https://hghofficial.com/serovital-hgh/ (accessed 03.06.19). Copyright © Lauren McHugh. Site design by The Blog Prettifier.